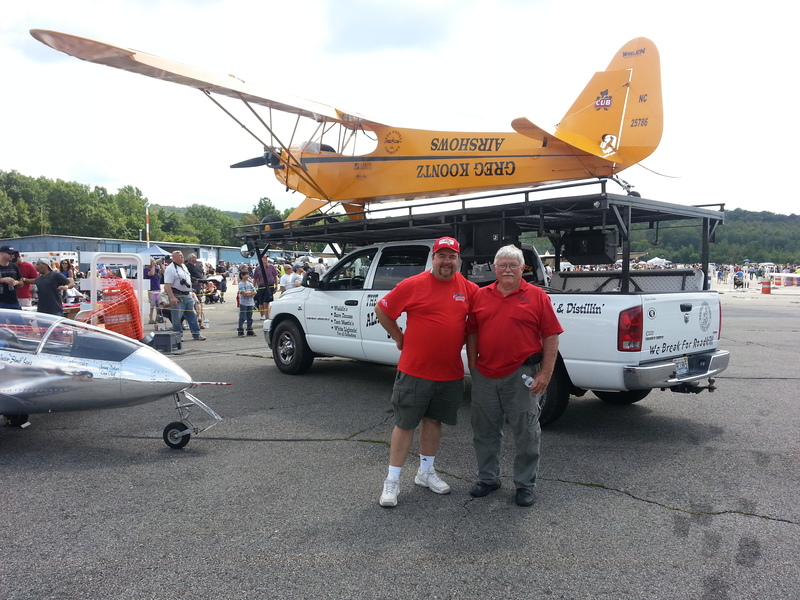 Aviation Insurance Resources (AIR) agent Jon Shimer recently attended the fifth annual Greenwood Lake Air Show in West Milford, New Jersey. Shimer was one of nearly 21,000 attendees, the highest attendance ever for the three-day event. The previous record for the Greenwood Lake Air Show was roughly 17,000, back when the event was only a two-day affair. The Greenwood Lake Air Show featured a car show, kids carnival, live music, and, of course, numerous aircraft and nationally recognized performers, such as five-time U.S. National Aerobatic Champion and two-time Red Bull Air Race World Champion Kirby Chambliss – 2012’s headliner- Jerry McCart and his F-5 fighter jet-engine-powered funny car, Justin Lewis and the world’s smallest jet – the 860-pound FLS Microjet –the Commemorative Air Force brought a rare P51-C model Mustang, the Iron Eagle Aerobatics team, and Greg Koontz’s Alabama Boys Comedy Team. The Alabama Boys include Fred Masterson as Uncle Fred, Walter Harvey as Grandpa, and Jason Hankins as Instructor Bob, with AIR agent Jon Shimer doing the narration. Jon was in Oshkosh, Wisconsin for EAA Airventure, the Grand Daddy of Airshows, and then the Greenwood Lake Airshow in West Milford, New Jersey. His next appearance is in Memphis, Tennessee September 26-30. Greg Koontz’s Alabama Boys Comedy Team has already signed up to return to the Greenwood Lake Air Show in 2014. To find out more about the Greenwood Lake Air Show or Aircraft Insurance, please contact Aviation Insurance Resources by calling 877-247-7767 or visit AIR-PROS.com today to receive your free Aircraft insurance quote! AIR offers a wide range of aircraft insurance options for aircraft of all makes and models, from experimental aircraft to standard aircraft, such as Cessna Aircraft, Beechcraft, and Cirrus Aircraft to Robinson Helicopters, Piper Cubs, and Corporate Aircraft.